Not surprisingly, all the overseas Hatfields appear to be in former British colonies or territories. Given that Hatfield in Hertfordshire is linked to famous British Victorian Prime Ministers and Foreign Secretaries some of these are undoubtedly named after it. In others the origin of the name is less clear. Hatfield, Arkansas, USA – according to a local website, founded around the turn of the 20th Century (formally incorporated in 1901), and named after Sam Hatfield who was killed in a blasting accident while working on the railroad. Suffered a major fire which destroyed much of the town in January 1938. Celebrates its birthday on the last Saturday in June. Hatfield, Harare, Zimbabwe – Salisbury, its capital when it was known as Rhodesia, is named after the 3rd Marquess of Salisbury of Hatfield House. Named after this Hatfield (Herts). In 2008, the 'Troopie' memorial of the Rhodesian Light Infantry, which was originally in their Cranborne Barracks (Cranborne is another of the family's titles, and also a suburb of Salisbury), was relocated and rededicated in the grounds of Hatfield Park, and the regiment's colours installed in the family chapel. Apart from the historic associations there is a more recent and personal one. Lord Richard Valentine Cecil, younger brother of the current 7th Marquess of Salisbury and formerly an officer in the Grenadier Guards, was 'killed in action' while covering the conflict following the Unilateral Declaration of Independence (UDI) as a journalist in 1978. Hatfield, Indiana, USA – named after the town's founder, James Hatfield. Originally thought to be from Kentucky, he married and settled in the area after having served in the Union Army. He died in 1890. Hatfield, Manchester, Jamaica – somewhat confusingly, this Hatfield is in the parish of Manchester (created in 1814) in the county of Middlesex (near its capital, Mandeville). It is easier to understand when it is revealed that it is named after the then Governor of Jamaica, the Duke of Manchester (Mandeville was his son). However, it's not clear when this Hatfield was founded – one source suggests 1670 (Britain seized control in 1655). However, in the apparent absence of a person with the name, it is a strong possibility that it is named after this Hatfield (Herts). Hatfield, Massachusetts, USA – the town's website records it was a settlement since 1660, formally incorporated as a town in May 1670, and was named after this Hatfield (Herts). In fact, at the time of writing, it is the only other Hatfield commemorated in this Hatfield (the war memorial garden, opposite the railway station, has a plaque inscribed: "This plot of land has been dedicated to the town of Hatfield Massachusetts United States of America by the Parish of Hatfield, England as a mark of mutual friendship. American Bicentennial Year 1976" (picture at the top of this page). Hatfield, Minnesota, USA – Small town in Pipestone County. Founded in 1880 and incorporated as a village in 1919. Reputedly got its name from a man working on the railroad whose hat kept being blown off into a field who suggested it be called 'hat field'. Current population of around 50. Possibly the only Hatfield known not to be named after a person or place. Hatfield, Missouri, USA – appears to be a very small settlement. Origins unclear. Hatfield, Montgomery County, Pennsylvania, USA – confirmed as a township in 1730. Local websites suggest it was named after a Welsh settler called John Hatfield but more likely to be named after this Hatfield (Herts). 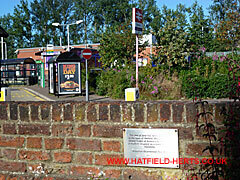 Appears to be one of the larger Hatfields as its online history states Hatfield and South Hatfield were merged in 1898 to become the Borough of Hatfield. Hatfield, NSW, Australia – Appears to be a remote outstation. Comes under Balranald Shire Council, which covers an area of around 21,400 sq km (roughly half the size of the Netherlands) but only has a population of around 2,500. Hatfield and the neighbouring settlement of Clare on the Ivanhoe Road (connecting the towns of Balranald and Ivanhoe) are in an area stretching around 100km outside mobile phone reception (according to a letter dated 25 November 2011). Internet connection is limited to direct satellite access. Main industry appears to be raising cattle and sheep. Hatfield, Pretoria, Gauteng Province, South Africa – a suburb of Pretoria, home to a number of embassies. Strong possibility that it is named after this Hatfield (Herts). Hatfield, Saskatchewan, Canada – appears to be named after Hatfield Valley – one of two valleys in the Qu'Appelle (derived from a Cree Native American name) area. However, it is not clear how that came to have the Hatfield name. Hatfield, Wisconsin, USA – history reportedly dates back to 1836 when the first known European, Norbert St Germaine, settled in the area. Local author Robert W Teeples has written a history of the town called 'Historic Hatfield'.